An Opinion On Sports: How About Zero Body Fat? 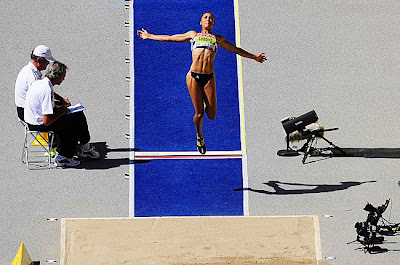 Jessica Ennis of Great Britain performs in the long jump portion of the heptathlon at the 2009 World Track and Field Championships. The women's outdoor heptathlon consists of seven events, four of which are contested on the first day of competition. The final three events are completed on day two. The events are: 100m hurdles, high jump, shot put, 200m dash, long jump, javelin throw, and 800m run. The heptathon has been contested by female athletes since the early 1980s.